Titus Corlatean interview: Romania’s foreign minister on Russia, Putin, and the need for more U.S. troops in Europe. 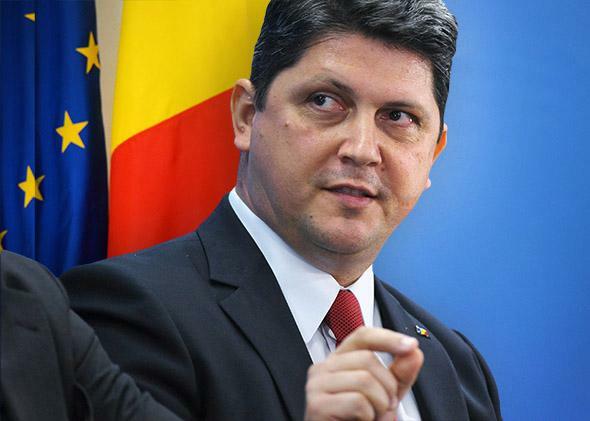 An interview with Romanian Foreign Minister Titus Corlatean. Romanian Foreign Minister Titus Corlatean speaks at the Toward a Europe Whole and Free conference at the Atlantic Council on April 29, 2014, in Washington, D.C.
My country, Romania, represents the eastern border of both NATO and the European Union. What happened with this absolutely illegal annexation of Crimea by Russia violating international law—happened only 200 miles from the Romanian border. The other Russian temptation, that relates to the status of the Moldovan region of Transnistria, is happening at our border. We are extremely concerned with what is happening in Eastern Europe and around the Black Sea region. We are part of the region. We are the eastern flank of NATO. As foreign minister, I strongly criticized the actions of Russia. Yes … but also looking to the south of Ukraine, going toward Odessa and even toward Transnistria in the Republic of Moldova. [Monday] the mayor of Kharkiv was shot. Do you think Russia will actually send troops into the south and east of Ukraine? It is a form of blocking the European aspirations of Ukraine as a whole and maintaining a certain influence on Ukraine. The interest of Russia is to maintain its strong influence in the former Soviet Union space. It is related to Ukraine and to the Republic of Moldova. Yesterday, based on the political decision of the EU, Moldovan citizens started to be the beneficiary of free movement within the EU, so the need for visas was eliminated for Moldovan citizens. The most important objective in the near future is the signature of the [EU] association agreement and the free-trade agreement with the EU. This is something we are extremely concerned about. We were among those allies within NATO advocating for a faster and stronger military presence on the eastern flank to consolidate the confidence of Romania, Poland, and the Baltic states in the collective security, which is guaranteed by the alliance. The redeployment of military capabilities of NATO starting with Poland, Romania, and the Baltic states. I welcome the redeployment of troops in some cases, the air support, the AWACS. Poland and also in Romania because Romania is also the subject of the surveillance of AWACS. They are patrolling and monitoring Poland and Romania. Recently we had military exercises together with the American F-16s coming into Romania together with our military fleet. There was a recent announcement of a supplementary six air fighters sent by Canada to Romania—F-18 Hornets. And then also the American and the French military ships in the Black Sea are participating in military exercises together with the Romanians. This is consolidating the confidence of public opinion. It is extremely important to have a solid U.S. presence in our countries, including Romania. We have to make a distinction. In the end, the [NATO] alliance gives security guarantees for the members. For us it is a subject of our own choice. Ukraine abandoned its candidate status for NATO for its own internal political reasons. At that time, we were very serious and committed and became members of the alliance. So we have our national security guaranteed by the alliance. Those who are not members of the alliance do not have a direct guarantee. I think both sides—Europe and the United States—can adopt even more firm attitudes. We asked Russia to take action to de-escalate. And what has followed in the past few weeks and days is definitely going in the wrong direction. They are members of the alliance, so they have the assurance of the security of the alliance. I hope not. You can imagine what sort of pressure the Russians are putting on those who are not members of the EU or of NATO, as is case with the Republic of Moldova. They have Russian troops in the Transnistria region of Moldova. The current Romanian government started last year a very ambitious project of advancing with interconnecting gas pipelines between Romania and the Republic of Moldova, offering a connection to the European network of energy. Absolutely. Romania is less dependent on Russian gas because we have our own national resources. Romania can be a regional hub, but the problem is that Russia—in controlling Crimea and that part of southern Ukraine—is limiting the access of Ukraine to the Black Sea and its own natural resources. This is a very serious risk for Ukraine. You are in a difficult position—you have Moldova on one side and Ukraine on the other. We have the largest border among the EU member states with Ukraine. It will be extremely important to support the current Ukrainian government to organize presidential elections on May 25 because having ensured the legitimacy of the new Ukrainian leadership is extremely important. We hope the legitimate sovereign will of the Ukrainian government will be successful. The former Soviet Union remains a complicated region. But when you see political will to put in place reforms and advance according to a European path, then of course we have great sympathy and expressed great support for this. Yes, but many years ago. We chose our direction freely. We chose to be members of both the European Union and NATO. And Romania today is fundamentally different than it was 20 years ago. Last year we had the highest economic growth in the European Union. Romania is the second-biggest market in southeast Europe, after Poland. The fact is that the U.S. has rediscovered the geostrategic importance of Eastern Europe. Previously the Asia-Pacific region was extremely important for the U.S. We encourage the United States to be more present in our region. On our side, Romania favors increasing our share in the burden of our alliance and our share in terms of the budget for [defense] expenditures. The Romanian government increased the budget for defense expenditures. Our target is to reach 2 percent of GDP allocated to the defense budget by 2016. We encourage other European allies to do the same. We are interested in having a more substantial U.S. military presence in Romania. We are the first country in which the missile defense system will be deployed. In 2015 the system will be operational [in Romania]. We are interested in having a strong political, military, and economic presence of the United States in Romania. I think we increased the level of interest in Washington. We are in favor of a more substantial American presence in Romania, and this is my message. I think in Washington it is better understood—the potential threat of Russia putting challenges on different countries. They remain very active in our region, and that is why we have to be very firm. Not for my country but for the region—for Ukraine and the Republic of Moldova and for Georgia, yes. and NATO. This is the wish of Georgia, Ukraine, and the Republic of Moldova.